I can’t believe it’s been more than a month already since the APS symposium! The Alberta Paleontological Society is a group of amateur and professional paleontologists from around Alberta, which organizes summer field trips and an annual symposium and workshop series. The symposium is always a good time, and there’s usually palaeontology professors and grad students from the University of Calgary, University of Alberta, and Royal Tyrrell Museum (plus often other institutions like the T. rex Discovery Center, Canadian Fossil Discovery Centre, Tumbler Ridge Museum, and Grande Prairie Regional College). This year I gave a talk about my travels in Korea, China, and Mongolia last summer, and was also invited to host a 3-hour workshop the following day. Because I was expecting a largely adult audience (rather than families or mostly small children), I had to come up with something a little different than previous dino-workshops I’ve given. What do you do that’s hands-on, not super boring, and not a craft? Well, two years ago I, and my fellow grad student Mike Burns, had given a talk about the frequent (and usually hilarious) misrepresentation of ankylosaurs in the popular media, and it had been a big success. So I decided to run with that. I brought with me a bunch of ankylosaur casts (skulls, a tail club, a foot), and some real fossils (osteoderms, thin sections, teeth), and lots and lots of popular reconstructions of ankylosaurs, mostly in the form of toys (or, uh…scientific models?) and books. These were scattered around the lab, which holds about 20 people. Over the course of the workshop, I talked for about 10-15 minutes at a time about the anatomy of ankylosaurs, starting with a general overview, then moving on to the skull, skin/armour, tail, and legs and feet. We finished up watching a couple of clips from various documentaries and talking about posture, movement, and behaviour. Each workshop attendee picked 2 or 3 reconstructions to evaluate during the workshop, and had a worksheet to make notes about the anatomy of their reconstructions. 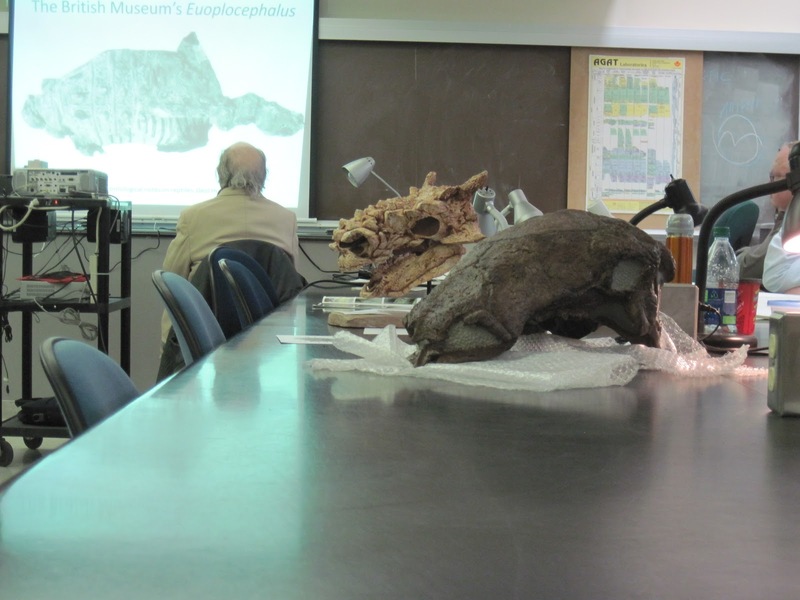 After I would talk about some aspect of ankylosaurs, there was 10-20 minutes for looking at specimens, discussing the pros and cons of different reconstructions, and asking questions. Then I’d call everyone back together and ask who had the worst/best reconstructions and why. 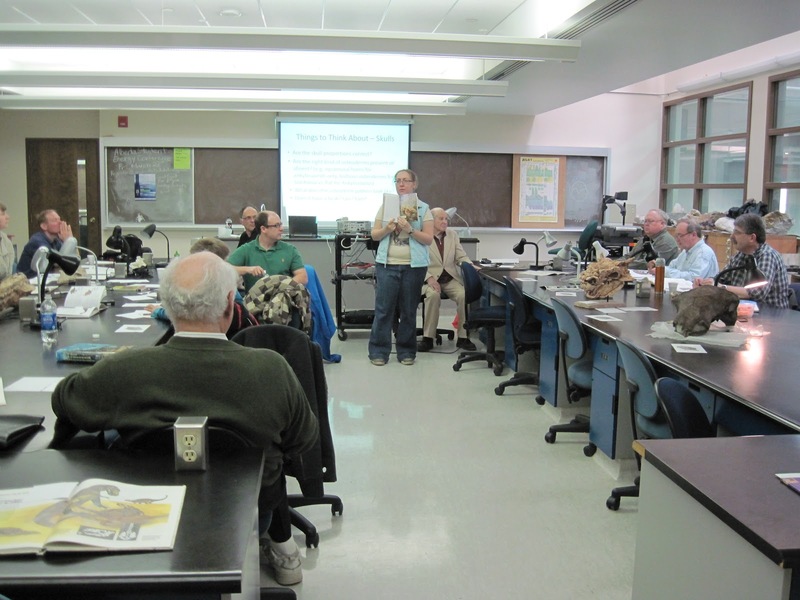 If you’re ever called to do a dinosaur or paleontology workshop for adults – do this! It was lots and lots of fun. It required fairly minimal preparation, which is a plus if you’re often asked to do this sort of thing. I spent a couple of hours at most putting together a powerpoint of mostly specimen images, picking out books and toys and fossils to bring with me, and making up some handouts). It’s a great way to engage adult learners, and could probably easily be restructed to work for kids or families as well. More importantly, I think this might be a really effective way of communicating a lot of information about paleontology in a way that will encourage the general public to look at popular science more critically. Since most people will generally not be going to the primary literature to answer their paleontology-related questions, their information is going to come from illustrated books, magazine articles, computer animated documentaries, and museum exhibits. If I had just discussed the anatomy of ankylosaurs via presentation and specimens, I’m not sure a lot of the points I discussed would have sunk in as much as they did by critiquing the illustrations and toys most people are likely to encounter. This was an easy way to make a talk more hands-on, and the casual atmosphere and conversation between the workshop attendees was really great. The next APS Symposium will be held on Saturday, March 16, 2013. The symposium is always held in the Jenkins Theatre at Mount Royal University in Calgary, Alberta. That's a great idea for the adult workshop. Sounds like it was very successful. Nicely done!